Like other American pioneers, Laura Ingalls Wilder and her family relied heavily on the harvest from their own garden for food and nourishment. 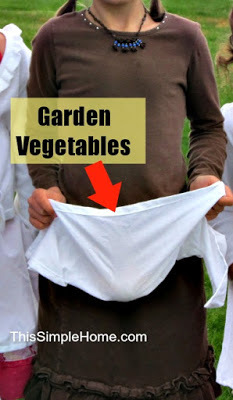 Without planting a single seed or hoeing dirt, you can provide a fun gardening activity for children of various ages. Gather enough garden vegetables so each child playing can harvest three to five items. Try to have a nice variety of produce including an item or two they may not have seen before. 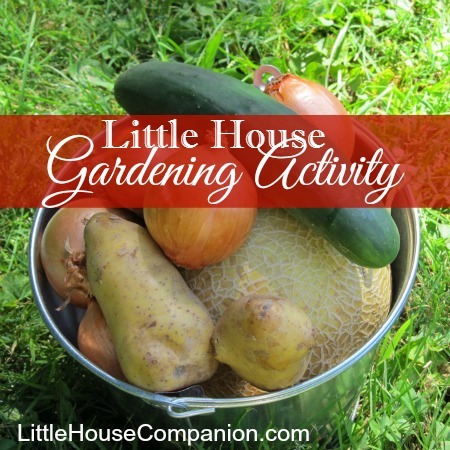 Potatoes, onions, sweet potatoes, cucumbers, beets, turnips, carrots, melons, tomatoes, green beans, peas (in pod), and radishes are just a few ideas. Out of sight of the participants, spread items throughout the "garden." The garden may be a living room floor, a flower bed, or just a grassy area. Older children still enjoy harvesting the Little House garden if challenged to find the produce a bit more. Longer grass, tree roots, and uneven ground helped the 2nd-8th graders (pictured below) enjoy the challenge. Get to work harvesting the garden! Tell the Little House gardeners the boundaries for the garden if it is not obvious. Explain where they will place all the produce once harvested. Baskets and buckets are handy for this. If you want to extend the activity, have them collect items one at a time. This is especially helpful if you have a younger group or if there is a wide age range. If the children have aprons, have them harvest directly into the apron. When the harvest is over, be sure to have the children identify each item. 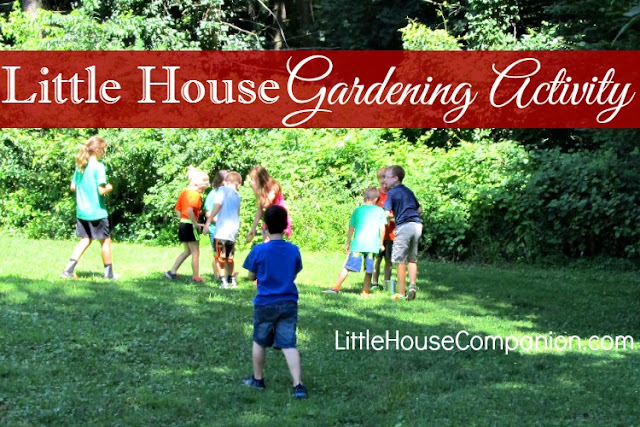 We enjoyed this garden harvest activity for our Little House birthday party and activities. This past summer I also facilitated the garden harvest with both a preschool and school-age group as part of our Pioneer Day. I adapted it for each group, and they all loved it! If you are focusing on the Little House books and not just pioneer days, take advantage of the Little House in the Big Woods Discussion Guide. You may also be interested in the free printable Garden Game which uses strategies from the game Battleship to find and harvest garden produce.